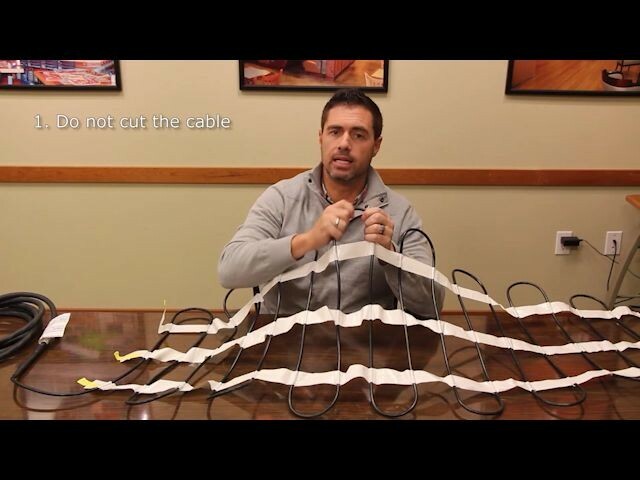 When it comes to Roof Deicing and Gutter Trace Solutions, Remember this: Not all Roof Heating Cable is Created Equal. Beware of Cheap Local Hardware Store Heat Cable. If you’re currently shopping for a roof heating solution, don’t settle on one system too quickly. Before you buy, it really pays to give Warmzone a call. They offer a range of affordable, reliable products to suit your home and your budget; and access to a staff of knowledgeable, reliable professionals to help you make an affordable, informed decision you can live with. Why not buy heat cable at your local home improvement center? As with any home improvement project, you’ll find there are many options, including many “bargain” roof heating cables that can be easily purchased right off the shelf. Many of these cables are designed to only deliver minimum wattage, which means that they will not perform well in extremely cold temperatures. 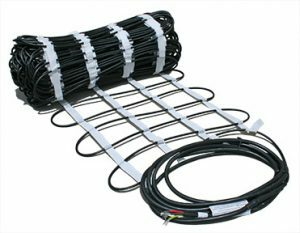 Warmzone offers a large selection of proven heat cable specifically designed for roof deicing applications that can easily handle any cold-weather job. Cheaper cable can also suffer from deficits in performance due to poor construction. Consider the outer jacket or covering of a radiant heat cable. On a “typical” cable, this outer jacket tends to bubble or separate from the cable core when the cable is manipulated for turns during installation. These irregularities can create stress points on the cable, allowing water to reach the core, resulting in erratic heating and eventual cable failure. Warmzone self-regulating heat cable has a higher quality outer jacket that helps to ensure the integrity of the cable. As a result, this flexible cable construction delivers a more consistent, reliable performance than a solution you might find at your typical hardware chain. Warmzone’s roof deicing and gutter trace cable is rated to perform in the worst weather conditions winter can bring. And if you’re thinking of installing the radiant heat system you just picked up from your local hardware today, you’ll most likely have to wait until the temperature warms up. That’s because the carbon in a “cheaper” cable becomes brittle and can easily break when bent or manipulated in colder temperatures. The good news—unlike “bargain” heat cable, the high quality carbon center and outer jacket of a Warmzone cable remains flexible at temperatures as low as 0 degrees Fahrenheit, so you don’t have to wait until spring to install it. For long term, reliable performance, Warmzone’s self-regulating “R” cable sets the industry gold standard. 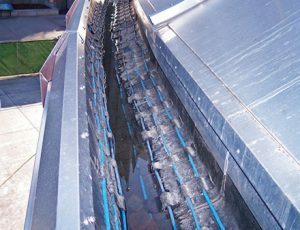 RHSR-R is UL listed self-regulating heat cable that can be used for roof and gutter heating as well as pipe tracing applications. This proven cable features a flexible, UV-stabilized thermoplastic elastomer overjacket that protects the carbon core for wet applications and exposure to the sun. This cable is versatile enough for both plastic or metal pipe freeze protection, and temperature maintenance of tanks, pipes and valves, and is covered by a 10-year warranty. Of course, the best way to save money on your gutter trace system is to purchase an affordable cable that will perform in extreme cold and last as long as your roof. For more information on quality roof deicing solutions, give Warmzone a call at 888.488.9276. Don’t get Caught in a Deep Freeze. Protect your Home with a Warmzone Roof Deicing System. Keeping your roof clear of ice and snow buildup is critical to maintaining the integrity of your home, and Warmzone offers the perfect snow melting solution for the job. With a fully-automated Warmzone radiant heated roof, you won’t have to worry about costly ice and water damage, frost erosion or dangerous falling ice any longer. Unlike the bargain roof heating solutions you might find at your local hardware store, Warmzone radiant heated roof systems are rated for extremely cold weather and are fully-automated. They are controlled by automatic sensors designed to detect changes in temperature and precipitation. When conditions warrant, the sensor sends a signal to activate the heating element just as the storm starts, preventing snow from accumulating on your roof. There’s no switch to flip, no weather channel to monitor. With a Warmzone radiant roof heating system, you simply set it and forget it. No matter what the conditions, Warmzone RoofHeat systems will keep your roof, gutters and downspouts clear and dry. If you’re concerned about the cost of heating your entire roof, no worries! Warmzone offers a wide selection of proven roof deicing systems that can be customized to meet your specific needs. Gutter trace systems, for example, are easily installed in existing gutters and downspouts to melt ice and snow, allowing it to freely flow down the roof and through the downspout and away from your home. Or choose a Warmzone RoofHeat panel system. They also rely on self-regulating heat cable which is channeled into an aluminum panel to quickly warm the edges of your roof and prevent snow from having any chance to build up. Another option, RoofHeat STEP low-voltage heating elements can be installed under the shingles, in roof valleys and problem areas of your roof where snow and ice have a tendency to build up. These low-voltage systems can also be safely installed under metal roofs. Whatever your strategy, any snow melting solution for you roof is only as good as the cable behind it. Unlike typical “bargain” heat cable, Warmzone’s durable self-regulating heat cable is effective for roofs, gutters and drainpipes regardless of the conditions. Heat cable commonly found in large hardware stores is low-end cable that often tends to crack and break under cold conditions. But Warmzone’s heat cable is more durable under cold weather conditions. The self-regulating heat cable features a solid inner core surrounded by a rugged, durable outer jacket that reduces the chances of “bubbling” or pulling away from the core when the cable is manipulated, and is completely waterproof. 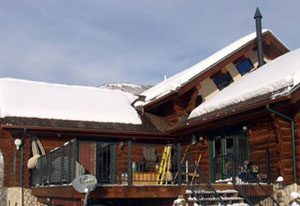 The cable can be installed in cold or warm weather to protect your roof and home from ice dams and eliminate the costly results of water damage. Remember, while those icicles may look pretty, they can be a sign of bigger problems. Make a smart investment in your home by installing a trusted roof heating system from Warmzone. Call today at 888.488.9276. It’s that time of year to dig out the coats, snow boots and Halloween costumes again. But there is still time for homeowners to decide how to spend this winter season. Will they choose to labor all season with a snow shovel to keep their walks and driveways clear, or are hoping to relax and let a heated driveway do all the work? October is a prime month to help homeowners plan for winter. While a driveway heating system may seem like a luxury for many customers, Warmzone is making it easier than ever. Whether your customers want to heat an existing driveway or create a stylish new brick paver driveway, Warmzone offers the ideal snow melting cable – ClearZone heat cable – to keep driveways free of snow all winter long. The ClearZone cables are ideal for melting snow in just about any outdoor area, including the growing trend for building outdoor living spaces for recreational and entertainment purposes. Several past articles have highlighted outdoor heating projects, such as parlors and patios, each of which utilize the CZ cables to ensure the ultimate in comfort, longevity and ease of use. An outdoor space is a great way to add value and comfort to homes, while still keeping within budget. ClearZone heat cables are made specifically to withstand the harshest construction applications and extreme weather conditions. Durable CZ snow melting cables can be embedded in concrete and asphalt, as well as under brick pavers. Many snowmelt systems are not capable of withstanding the harsh temperatures of new asphalt; and low-voltage systems do not pass the ASHRAE standard for snow melting systems. Warmzone offers one of the most comprehensive warranties on the market. Warmzone is a trusted manufacturer of radiant heat solutions and has a reputation for offering only the highest quality radiant heat products. Installing a snow melting system eliminates the need for harsh chemicals and snow removal devices, and will increase the life span of your driveway and the value of the home. Whether you’re looking to install a heated driveway or create a new, warm outdoor space, Warmzone can help you plan a system that keeps within your customers’ budgets while providing a lifetime of benefits. Climatologist John Casey, a former space shuttle engineer and NASA consultant, believes that we’re in for decades of unusually cold winters with greater snowfall. And Casey isn’t alone in his claims. Noted Russian astrophysicist Habibullo I. Abdussamatov has even gone so far as to argue that a new mini-ice age has just begun. According to weather experts, a decline in solar activity has kick-started a major alteration in global climate that is projected to last at least 30 years. The prospect of frigid winters with record snowfall for the next several decades is not a pleasant one, but there are steps one can take to ease the pain of the upcoming “mega winters”. Installing an automated snow melting system can ease the burden considerably, and even save you money in the long run. Warmzone offers affordable snow and ice melting options designed to keep your driveway, sidewalks, steps, and roofs clear of ice and snow – eliminating the need for manual snow removal. Every snowmelt system utilizes industry leading ClearZone heat cable that is easy to install and can be used in almost every type of snow melting application. Available on spools or in mats with tape backing for easy roll-out installation. (There is no mesh backing to impede concrete pours, making Warmzone solutions the optimum choice when it comes to installing radiant heat in concrete projects.) 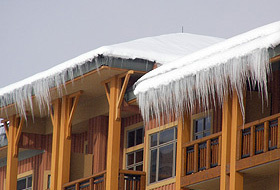 Self-regulating heat cable and RoofHeat STEP systems are used for roof deicing. Why Invest in a Warmzone Snow Melting System? Fully Automated: You’ll get a fully automated snow removal solution that can sense and respond to snow before it can accumulate. ClearZone systems are activated by aerial- or pavement-mounted snow sensors that signal a small wall-mounted control unit to activate the system when needed. Each system also features a manual on/off switch to deal with snowdrifts or ice that has formed in shade. Fast Response Time: Warmzone’s electric snow melting systems feature rapid response times, heating your driveway quickly and efficiently. Enhances Safety: Radiant heat systems offer instant, consistent protection from slips and falls caused by icy steps, walkways and driveways. Easy to Customize: Warmzone snow melting systems are easy to customize, so you can install a system that meets your specific snowmelt needs as well as your budget. Check out some of the snow melting options. Energy Efficient: Minimal operation times and low operating costs will save you money and time over the life of your system. Maintenance Free: These systems are virtually maintenance free, and backed by one of the best warranties in the business, for years of confident operation. These are just some of the benefits you can expect from a radiant heated driveway. But what really makes Warmzone a great choice for radiant heat is the level of customer service you can expect. Contacting them gives you immediate access to radiant heat professionals with deep industry knowledge, knowledge they are eager to pass on to you at no cost. When dealing with Warmzone, you’ll benefit from free installation support and in-house engineering and design services. You can get a schematic of your entire design system, plus a solid understanding of system requirements. Warmzone also offers free installation training and an abundance of information online. For a complete radiant heat solution, there’s no better partner than Warmzone. To find out more about Warmzone’s industry leading products and service, call 888.488.9276 today. 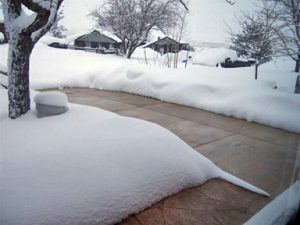 Radiant heated driveways offer many benefits; however, a snow melting system is the sum of its parts and only as good as its design and installation. While there are many products available, Warmzone systems have proven to be the clear favorites among professional installers. These tried and tested solutions are carefully considered by Warmzone “resident” professionals with deep industry knowledge and experience. What does this mean for you? When dealing with Warmzone, you have a wide selection of affordable products that outperform the competition in all phases of installation and performance. Consider a recent conversation between a Warmzone professional and an experienced installer. The installer preferred to avoid using electric snow melting mats based on an experience with a competitor’s heating mats years earlier. During the concrete installation, he noticed a significant issue. The mesh backing on the competitor’s mats impeded the concrete pour, which dramatically affected the quality of the concrete installation. When the concrete cannot flow through the mats, small air pockets can result, resulting in a weakened driveway that is susceptible to cracking and collapsing. For the installer’s next radiant heat install, he opted for heat cable off the spool to ensure a proper concrete pour. As effective as the cable can be, cable off the spool requires more installation time, as the cable must be secured to the remesh with zip ties every 6 to 12 inches. Shortly after that installation, the installer made a business-boosting discovery. After expressing his concerns with Warmzone, the installer learned that Warmzone snow melting mats offer significant advantages over similar products. Because of the unique construction of Warmzone snow melting mats, concrete maintains its integrity by enjoying an unimpeded pour. Not only is Warmzone heat cable the premier heating cable on the market, but the mats have become the solution of choice for concrete installers. When it comes to performance and durability, the spacing between the runs of cable, tape and mesh backing truly matter. Warmzone’s ClearZone radiant snow melting mats utilize tape (without a mesh backing) to properly maintain their overall integrity during installation. Because ClearZone mats don’t include a mesh backing, concrete can flow through the mats during a fresh concrete pour, ensuring a strong driveway that will not buckle or cave over time, while enjoying superior performance characteristics. The ClearZone snowmelt system is an industry leader, and the premier snow and ice melting solution for both commercial and residential applications. ClearZone electric snow melting cable is extremely durable and versatile, and can be used for a variety of residential and commercial applications, from fresh concrete pours, to installation under hot asphalt and stone pavers. On the spool, ClearZone cable allows for greater flexibility in terms of custom layouts, including hard-to-reach, intricate configurations for steps and sidewalks. 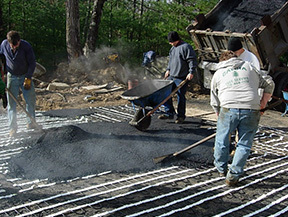 Whether you’re embarking on a radiant heat project yourself, or you’ve enlisted the assistance of a contractor yourself, you’d be wise to enlist the help of Warmzone. Warmzone provides professional system design/layout, so you know all the power requirements and technical specs before a foot of cable is installed. You’ll also have access to free installation support from an experienced pro. For more information about Warmzone’s products and services, call 888.488.9276. Warmzone has established its position as a trusted industry leader by combining unparalleled customer service with the most advanced, proven solutions available. Maintaining that status for more than a decade requires a consistent level of excellence on all fronts. That’s why Warmzone works tirelessly to provide customers with products that feature the latest, most advanced proven technology. As such, Warmzone is continually enhancing its product offering to include the most advanced options available. Warmzone’s latest product innovations feature enhancements to the renowned ClearZone snow melting heat cable. Already established as the reliable industry leader, ClearZone heat cable is the trusted workhorse used by construction professionals for a wide variety of snow melting applications. Recent enhancements have given the durable heat cable even more robust features, resulting in the release of the new ClearZone radiant snow melting heat cable. The enhanced ClearZone cable is a culmination of Warmzone research, technological advancements and feedback from construction professionals. During Warmzone’s free training courses for installers, we often receive valuable comments from experienced builders. Warmzone’s relationships with contractors have played a valuable role in keeping Warmzone on the front lines in the field and in touch with the latest construction trends. Enhanced cable that allows for lower installation air temperatures and quicker, easier installation that can ultimately lead to cheaper installation costs. Enhanced splice offers greater water protection and minimizes the potential for installation errors. A more rugged outer jacket ensures cable integrity. Grounding wire increases tensile strength and minimizes stretching. Enhanced capability for hotter asphalt installations. The new ClearZone heat cable includes several other performance enhancing features. For more details on ClearZone snow melting cable, contact a Warmzone representative at 888.488.9276. Asphalt installation professionals are giving Warmzone’s newly enhanced asphalt heating cable an enthusiastic thumbs up. Designed specifically for installation in hot asphalt applications, the new ClearZone asphalt heating cable stands alone as the industry’s premier snow melting heat cable for asphalt heated driveways. Warmzone has established itself as a trusted leader by working tirelessly to offer personal installation support and the best customer services with the most advanced, reliable products on the market. Warmzone’s commitment to continually research and test new products, as well as enhance its existing products ensures that customers always have the most advanced solutions possible at the time of their purchase. One reason why Warmzone is able to consistently offer the most advanced and sought after products is by listening to feedback from professional builders. During Warmzone’s free installation training courses, construction professionals often provide valuable feedback that allows Warmzone to develop and test new technologies and add specific enhancements to its current products. Given recent technological advancements, combined with requests/comments from professional builders, Warmzone recently announced the new features of ClearZone asphalt heating cable. Built upon the rugged qualities of its reputable, industry leading ClearZone heat cable, the latest features added to the cable demonstrate Warmzone’s commitment to continually upgrade and provide the very latest proven technology with the highest quality products possible. 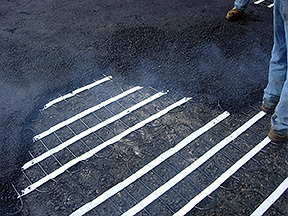 ♦ Significantly greater installation temperature capability, allowing for installs in much hotter asphalt. ♦ Every cable is tested prior to leaving the manufacturing facility (unlike “batch” testing, which is the standard procedure of most manufacturers). ♦ Increased cable strength with additional features allowing for installation in colder air temperatures. ♦ Enhanced splice provides easier installation and minimizes the potential for install errors. ♦ Greater flexibility in terms of designing and building systems that best meet custom specifications. For more specific information about the new ClearZone asphalt heating cable, call 888.488.9276.